Our first full day in PP starts with a bright sunny morning and it becomes very hot very quickly, which scuppers my plan to get a bit of balcony time before breakfast, as the balcony gets the direct sunlight at that time of day. After breakfast we go out to discover some more of the resort. After our traditional coffee stop we check out the marina area, where there are lots of nice little boats moored. Over the week I would become quite fascinated by this very spooky tree outside a house on the promenade! The layout of PP is also a little strange, as it is cut in half by a nature reserve/wetland called La Gola, which is home to rather a lot of ducks whom I would get a bit obsessed with as the week went on. Here are just a few of them. After just 2 days the Gran Cafe 1919 - a perfect people-watching spot overlooking the promenade, harbour and bus station (OK it's a big bus shelter, but hey!) 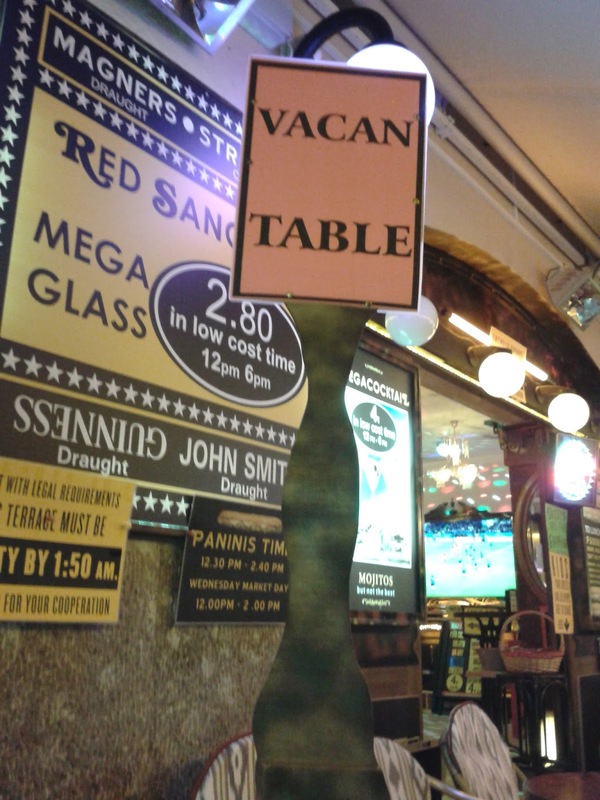 - has become one of our hangouts. 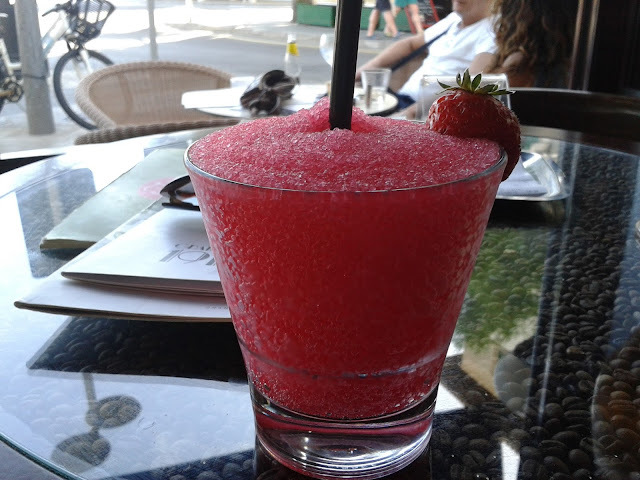 And on a hot day, what better than to chill out with a Strawberry Slush? The cafe is at the very start of a long row of restaurants and hotels at the 'pine walk' side of the promenade. If the one thing missing from your life is a cow-patterned wheelie bin, then feast your eyes on this! Tonight we face rejection at dinner-time yet again :( and we eventually give in and book a table for tomorrow night at one of those highly-rated tapas restaurants. In the meantime we end up with some very nice tapas at another restaurant, just across from where we had dinner last night. 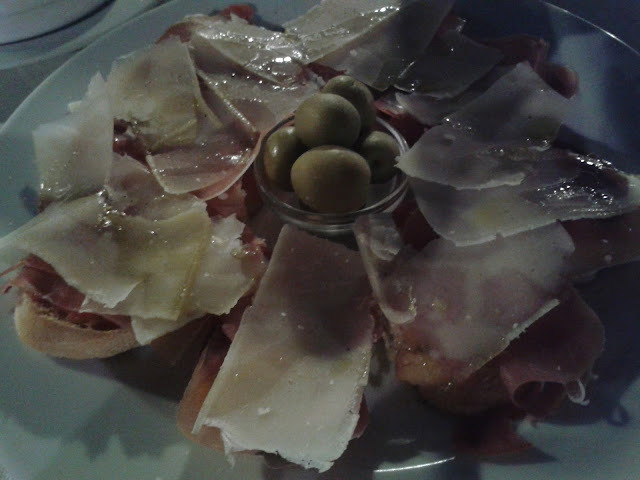 I decide to try a local speciality called Pa Amb Oli (pictured below) which is bread with olive oil and topped with razor-thin slices of serrano ham. Unfortunately due to my other very large tapas portions including mushrooms and patatas bravas, I don't manage to finish it off. Faithful travelling companion offers me some kind assistance! In the next instalment we're off to explore Alcudia town which is just a short journey from PP by bus.